Sometimes – OK, a lot of the time – fashion is about wanting something that you can’t really afford and don’t necessarily need. To make it even more difficult, these days, wallet-emptying price tags don’t always equate to quality on the goods they’re hanging off. Whether you’re in line for a bonus or have been saving to buy something that’ll mature like stocks, it makes fiscal sense to skip the one-season wonders and invest in pieces that will pay dividends in the long run. Here are 10 items that are well and truly worth the wonga, and the brands that do them best. 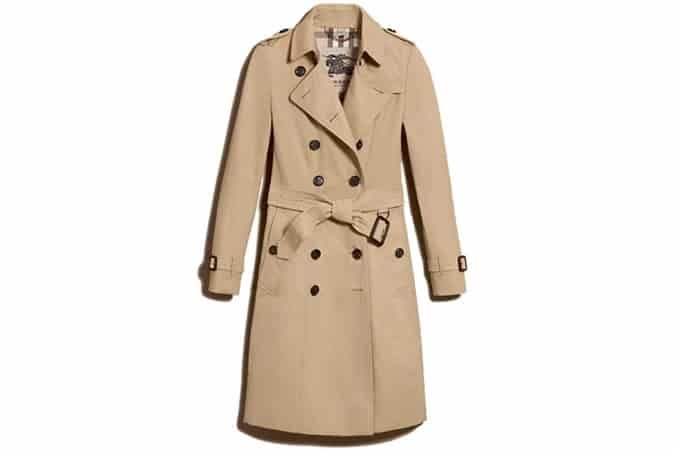 There are few items of clothing still on the shelves today that can be considered truly iconic, but the Burberry trench is unwaveringly one of them. Originally designed in 1895 for British officers during the Boer War, the style hasn’t changed dramatically in over a century. If it takes more than a history lesson to persuade you to cough up over a grand for a coat, rest assured the craftsmanship involved is exceptional. Comprised of 80 pieces assembled over 120 processes; each trench requires four hours of intensive stitching at the brand’s factory in Leeds – twice as long as it takes the heritage brand to make a suit. The trench is also a practical investment; one that is thoroughly versatile and, providing it’s cared for, one that will get better with age. “You can wear it if you’re a little bit more formal, or you can wear it with jeans and a T-shirt. I love it when the collar is up casually, but I also love it when you see City guys wearing it completely fastened up and buckled,” adds Bailey. Burberry The Chelsea Long Heritage Trench Coat, available at Burberry, priced £1,395. Throwing down a wad of cash on an expensive timepiece is one of the most grown-up milestones in a man’s life. However, the sheer volume of offerings across all price points can be overwhelming. For the mid-range watch, there’s often a trade-off between quality and affordability, unless you know where to look. Award-winning manufacturer Bremont prides itself on turning out high-quality, hand-built timepieces, and as such creates some of the finest watches within its price bracket. Having trained up watchmakers at its workshop in Henley-on-Thames, Bremont now manufactures its own cases and parts at a facility in Silverstone, the only brand to do so within the UK. “We only make 8,000-10,000 watches each year, which keeps our numbers relatively small and controlled,” says co-founder Giles English. Branching out from Switzerland doesn’t mean losing any of the Swiss rigour, though. Every watch in the core Bremont collection is accompanied by a performance certificate from the Contrôle Officiel Suisse des Chronomètres, confirming that the movement has passed the same strict chronometer guidelines as Rolex, Omega and TAG Heuer. The ALT1-C remains true to Bremont’s values of combining traditional watchmaking with technical innovation. In addition to a classic design that’ll last the ravages of time, steps have also been taken to ensure its value rises. “We intentionally keep our limited editions to very low numbers; and as we control our distribution globally, there is no grey market with discounted selling – this continues to support our second-hand market watch values,” adds English. Bremont ALT1-C Classic Chronometer, available at Mr Porter, priced £4,395. The saying ‘two left feet’ might refer to dodgy dad dancing these days, but believe it or not, 150 years ago, both shoes were the same shape. With family shoemaking heritage dating as far back as 1675, Thomas Church took it upon himself to produce different left and right shoes in 1881, and an industry standard was set. The brand’s innovation didn’t end there. If a shoe is only as good as its construction, Church’s are top of the class. Built with longevity in mind, it takes up to eight weeks and over 250 manual steps to craft a single pair of brogues. By using the world’s finest footwear manufacturing technique, the Goodyear Welt, Church’s designs are built to allow for future refurbishments such as re-soling, lengthening their life by decades and adding to their timeless appeal. Church’s Consul Classic Oxford, available at Churchs, priced £445. In a world of ‘it’ brands and logomania, spending a small fortune on a bag has become acceptable. However, without care for true craftsmanship, chances are after a season in the sun, you’ll be looking to move on to the next hot item. For a true staple piece, looking beyond the labels is key. Valextra has all the hallmarks of a traditional Italian fashion house, but it’s the business’ dedication to anonymity that makes it worthy of serious hard-earned cash. By omitting any branding across its collections, Valextra may not have the fashion clout of other names, but it does allow it to focus on quality over hype. All Valextra bags are handmade at its factory in Italy, with each bearing the individual identification number of the artisan who made it. So sure of its bag’s longevity, Valextra provides cleaning and repairs for life – in fact, many of the items from the very first run back in 1937 are still in use today. The backpacks from the Milanese label’s ‘V Line’ feature strong, clean lines and practical design that belie a product made from delicate soft-grained calfskin. It might cost more than a first car, but unlike a battered old Corsa, you can be sure it’ll impress for life. Valextra V Line Backpack, available at Valextra, priced £1,850. Ask any in-the-know millennial where to buy the best jeans, and the answer will almost certainly be Acne Studios. While they don’t come cheap, the Swedish design collective’s no-nonsense brand of denim has risen to the top of the pile for good reason. Making the name Acne desirable was never going to be an easy task, but in 1997 Jonny Johansson launched his brand under the moniker ‘Ambition to Create Novel Expressions’, and the term soon became a byword for Scandinavian cool. Johansson and his team began designing a pair of plain, deep blue, straight legged jeans. “We started with jeans because it’s the most important garment for everyone nowadays,” he says. Acne made a run of 100 pairs and gave them to ‘the coolest kids in Stockholm’. When word spread, leading fashion publications came knocking, and the rest, as they say, is history. In an arena like jeans where heritage names have reigned supreme for more than 150 years, it’s a testament to Acne’s straightforward approach of using high-quality, raw Japanese indigo denim that it has been able to position itself as the new classic. Acne Studios Ace Str Rw Jeans, available at Acne, priced £170. A well-designed, functional overnight bag is hard to come by, particularly one that will stand up to years of weekend trips and last-minute city breaks without becoming dishevelled. But that’s where Troubadour Goods breaks the mould. Founded by Abel Samet and Samuel Bail, the London-based brand was born from a simple need: handsome yet practical bags that work as well for travel as the everyday. “We spent years in pursuit of a bag that met our needs, be it a quick business trip or casual weekend away. The longer we searched, the more we realised that something like this simply didn’t exist, so we decided to create our ideal bag,” says Samet. Troubadour Goods Day Bag, available at Style.com, priced £1,095. If ever there was a case for luxury items not needing to cost the earth, it’s high-quality socks. Sliding into well-made shoes in cheap versions is akin to driving a Maserati in tatty pyjamas. Leicester-based experts Pantherella opened its doors in 1937, 80 years later the brand is still designing and creating sumptuous cashmere slip-ons in the same street as when it first launched. Pantherella Waddington Socks, available at Pantherella, priced £37.50. Leather jackets will always improve with age, but that doesn’t mean they’re all created equal. Nowadays, they’re available at every price point, but shelling out for one that’s built to last will mean you’ll have it for life. Originally designed in 1948, The Trialmaster was Belstaff’s first ever waxed cotton field jacket. The current interpretation has a more modern, streamlined shape and has been combined with the heritage brand’s signature supple calf leather – itself treated with a unique water-resistant finish and patina – to create an enduring classic item that retains all of its historic charm. Belstaff Trialmaster 2015 Jacket, available at Belstaff, priced £1,250. Designer sunglasses are big business, but because some licence out their brand to big factories, a good name doesn’t always mean good shades. There’s only one iconic pair that will look as fresh in a decade (or five) as they do today. Created in 1952, the Ray-Ban Wayfarer was inspired by mid-century design classics like the Eames chair and Cadillac tail fins. The style has been worn throughout the years by everyone from JFK to Jay-Z, by way of James Dean, David Beckham, Bob Dylan, Bradley Cooper, Ryan Reynolds, Johnny Marr… basically, every stylish man (and woman) to ever grace the A-list. Vintage Wayfarers retain more prestige than contemporary counterparts, but the timeless design means whenever you buy into the Ray-Ban model, it’s a purchase worth making (just don’t sit on them). Ray-Ban Classic Wayfarers, available at Ray-Ban, priced £125. Hand-tooled examples from renowned belt maker Anderson’s are a step up from the usual high-street holder-upper, and will probably last longer than the trousers themselves. The brand’s classic Saddle Leather belt is manufactured in Parma, Italy, using vegetable-tanned leather sourced from Europe’s most prestigious tanneries. Using oak bark and beeswax to finish, the full process takes up to six months to achieve the necessary thickness and strength. After several steps to get it ready to go, the final polish gives the belt its natural light and ensures a pristine appearance regardless of age. Anderson’s Hand-Tooled Black Leather 3cm Belt, available at Mr Porter, priced £90. Just like a high price tag, century-long history doesn’t always guarantee quality, either. Just 13-years-old, Common Projects is already credited with setting the high watermark for every sleek, clean-lined sneaker that followed. Launched by V magazine art director Peter Poopat and brand consultant Flavio Girolami in 2004, the brand specialises in classic designs that have a point of difference from the big sportswear brands. Combining modern design with heritage construction, all of Common Projects’ shoes – the most famous being the Achilles low – are made and hand-stitched in an Italian footwear factory, which previously only made formal dress shoes. They also come with a 10-digit serial number stamped on the outer heel, the only visible branding on these otherwise immaculately pared-back kicks that will never go out of style. Common Projects Achilles Leather Sneakers, available at Style.com, priced £290.